Is there anyone in my generation who didn’t play with some form of Fisher Price Little People toys? I clearly remember sitting in our family room for hours creating stories with my Little People and their house, apartment building and the ever important McDonald’s (with drive-thru)! In fact, my parents still have those toys in their attic just waiting to be played with again. 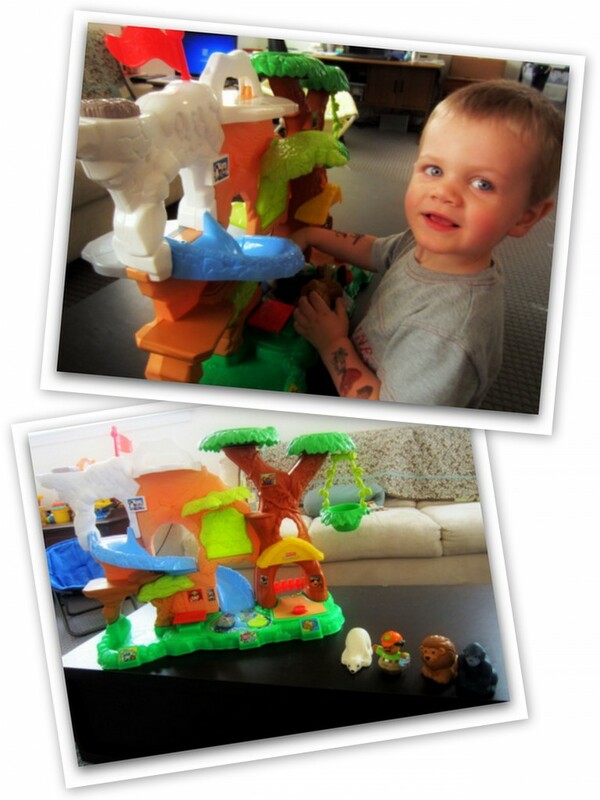 So when I was asked to do a review for the new Fisher Price Little People Zoo Talkers Animal Sounds Zoo, I simply couldn’t wait. I wanted to review it and I wanted to love it. I even wondered if I could do a truly objective review because I was so excited. Our zoo arrived and I hid it away until after Oscar went to bed. Jerry put it together that evening and it was waiting for Oscar all set up and ready to play with the next morning. And we were not disappointed with his reaction! It was like Christmas morning. He loved exploring the different “zones” and making the animals talk over and over again. And I knew that I wouldn’t have to worry about not being objective because this toy truly lived up to my expectations as a mother and as a kid at heart. In fact, I had an unused gift card burning a hole in my pocket so I grabbed the complementary Safari Truck and a couple more animals! Multiple ways to play. Oscar is two and a half and loves hearing the different names and animal sounds. But what’s more is that he really enjoys learning the habitats of each animal. His favorite aspects of the toy are the swing and the slide. Little People are just cute. I love the look and durability of the animals. They just seem to get cuter with each new installment. There is no Monkey! The Zoo comes with a fun DVD with a little story about sharing the spotlight. The star of the show is a monkey and Oscar kept asking where the monkey was as it didn’t come with the zoo. I decided to get it for him only to discover that the monkey character is not one of the animals offered. Too bad. The people don’t fit on the “talker” button. To hear the animal names, you place them on a small button on the zoo. It seems intuitive that the people would also fit on that button to learn their names and their job at the zoo. There is a platform button that you can push to hear about the zookeepers but I would have liked to see it on the same button. Since my son is on the younger end of the range, this was a bit confusing. All in all we LOVE this toy! As a parent, it’s really a fun update to a childhood favorite and watching Oscar really use his imagination is a delight. I would definitely recommend this toy for the toddler set. From now until November 30, 2011, you can enter your child making an animal sound for the chance to win $10,000! All in all it’s pretty simple! Head over to the Fisher Price Animal Sounds page for all the details! Have you played with the Little People Zoo Talkers yet? What do you think? Disclosure: I was provided with the Animal Talkers zoo to facilitate my opinion. All thoughts are my own. First of all how cute is your lil guy! ANd honestly my kid is STILL playing with Fisher Price little people that I have saved from the eighties ( I have a bit of a HOARDING problem!) but they do hold up well and at six years old I am MORE than happy to have him engaged in imaginative play with Little people zoo talkers than his DS… & these look adorable!